Christian is sitting here in a real Caterham F1 car during his tour of the Caterham factory. On the day Christian was shown around the whole factory learning exactly how they build an F1 car from start to finish! During the tour of the factory Christian insisted that he would have to sit in every single F1 Car they have to test it out! 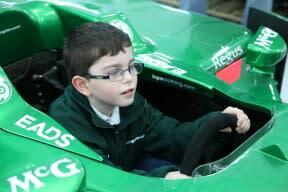 Christian also got to try out Caterham’s F1 simulator which was amazing! To top off an overwhelming and amazing day for Christian they surprised him two big bags of F1 goodies to take home with him! Amazing. A big thank you in particular to Joe and Christian of Caterham who were brilliant on the day and made sure Christian had a day to remember. Caterham have also listed some items on eBay with all funds going towards Tree of Hope to help Christian’s operation!